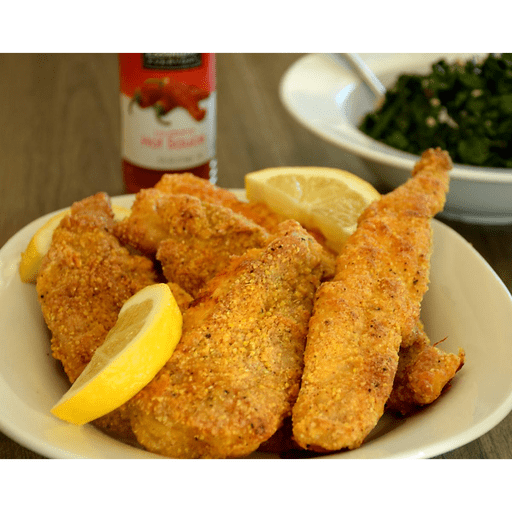 Heat things up this week with our Spicy Oven-Fried Catfish. While traditionally a southern recipe, this lightened up fish-fry alternative offers a new, bold way to enjoy catfish. While this recipe is not overly spicy, add more Louisiana hot sauce for more kick! 1. Preheat oven to 425°F. Line a baking sheet with parchment paper and liberally spray with cooking spray. 1. In a zip top bag, add cornmeal, flour, salt, pepper, cayenne, lemon pepper and paprika. Shake together. 1. In a large shallow bowl, whisk together eggs and hot sauce. 1. Add each filet to the bag of cornmeal breading to coat, then dip into beaten eggs, coating both sides. Dip once again into the cornmeal breading and shake liberally to coat well. Place filets on prepared baking sheet and spray with spray. 1. Bake 20-30 minutes, or until breading is golden brown and fish is cooked through. Allow fish to cool for 5 minutes after baking and serve with lemon and chopped parsley. For gluten free: Use gluten free cornmeal in place of yellow cornmeal. Use all purpose gluten free flour in place of whole wheat flour. Per Serving: Calories 270, Total Fat 10g (Saturated 2.5g, Trans 0g), Cholesterol 155mg, Sodium 1210mg, Total Carbohydrate 21g (Dietary Fiber 4g, Sugars 0g), Protein 4g, Vitamin A 6%, Vitamin C 0%, Calcium 4%, Iron 10% *Nutritional values are an approximation. Actual nutritional values may vary due to preparation techniques, variations related to suppliers, regional and seasonal differences, or rounding.